AM2R, short for Another Metroid 2 Remake, is an action-adventure game developed by Milton Guasti under the pseudonym DoctorM64, and released in August 2016 for Microsoft Windows. It is an unofficial enhanced remake of Nintendo's Game Boy game Metroid II: Return of Samus (1991), borrowing the art style and overall feeling of the Game Boy Advance game Metroid: Zero Mission (2004). 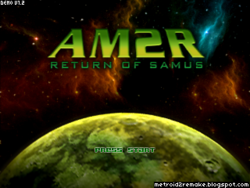 Shortly after the game's release, Nintendo sent DMCA notices to websites hosting AM2R; download links to the game were removed from its official website, but Guasti said that he still planned to continue working on the game privately. The remake is done in the style of Metroid: Zero Mission, adding a map system, new areas, minibosses, redone graphics and music, an updated artificial intelligence for enemies, and a log system. Logs give the player more information on Metroids, enemies and the game world after the player has defeated certain enemies or arrived in new areas. The game's controls are more rigid than the original's, and feature new abilities such as grabbing onto ledges, being more in line with the gameplay the series has employed since the Super NES game Super Metroid (1994). The game follows Samus Aran, who aims to eradicate the parasitic Metroids from SR388, their home world. It includes several new features, including redone graphics and music, a map system, and new areas and minibosses. Video game journalists liked the game, frequently calling it impressive and commenting on the improved visuals compared to those of the original Metroid II. This page was last edited on 16 November 2016, at 02:24.